This QuickStart guide for Mandrill will guide you through creating a new Mandrill account and connecting it to SendPress. Mandrill is one of the best options for sending with SendPress because of the integrated bounce handling, great performance and their fantastic pricing which allows you to send 12,000 messages per month for free. 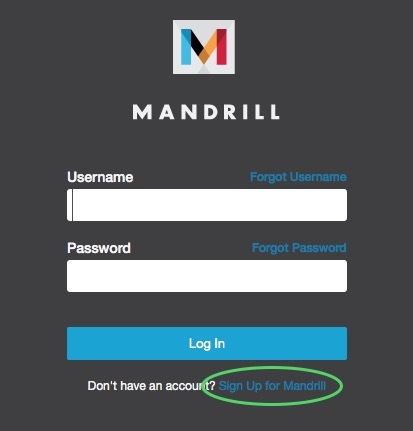 To get started with Mandrill, you need to create an account, which you can do from their login page. 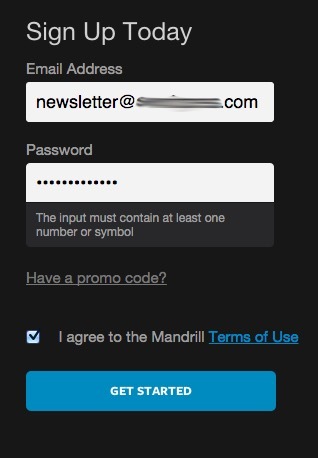 If you don't have an account yet, click the "Sign Up For Mandrill" link. On the next screen, you need to create your account. We would recommend using an email address that you will send from with SendPress. Create a password, but keep in mind that this password is only for logging into your account. It is not the password that will be used for sending email. We recommend only sending through the Mandrill API. In order to do so, you'll need to create an API key. On the next screen (below) click on the add API key button. 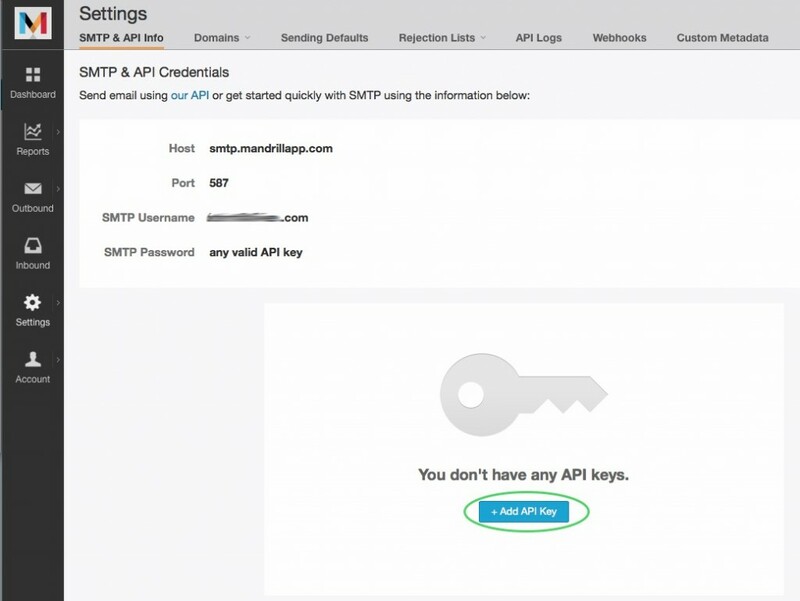 When you create the API key, it's a good idea to name it something that you will remember is associated with SendPress. Typically this would either be the email address you are going to send from or just SendPress. That's it. 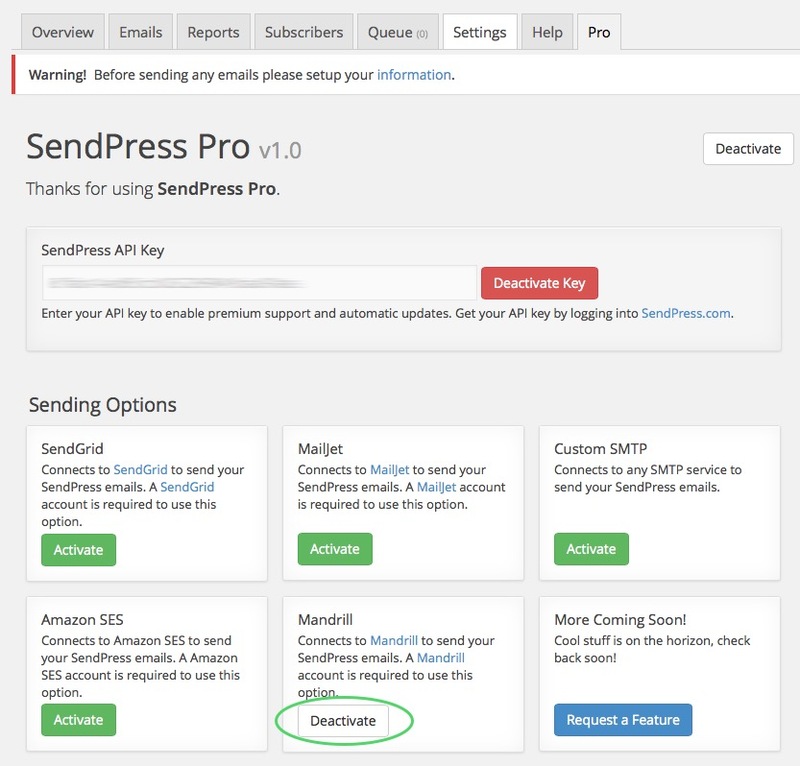 Just save edits and you will now have an API key that you can use with SendPress. Now would be a good time to copy the API key to your clipboard. Navigate back to your website where SendPress installed and click on the Pro tab of SendPress. Make sure that Mandrill API sending is activated. 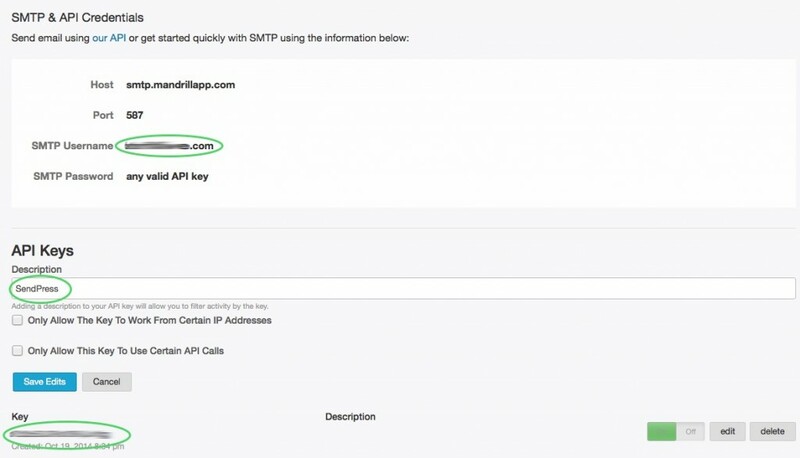 Navigate to Settings > Sending and enter your Mandrill API credentials. Your username is the email address that you used when signing up for the account and the password is the API key that you created. Go back to the Mandrill website and add your sending domain. If this is your first domain, it will prompt you to add your first one. Add the domain that you will be sending from with SendPress. Once the domain has been added you should take the additional steps to set up your SPF record and DKIM records with your DNS provider. The Mandrill documentation will walk you through the basics. Once you think you have everything set up properly you can verify your domain and the "red X's" should turn to green checkboxes. Completing the DNS setup is important because it will improve your luck with your messages reaching the inbox instead of the spam folder. Mandrill sending is a Pro feature.